Colome boys track team took fifth place at the state track meet this weekend in Sioux Falls. The Cowboys scored 36 points. 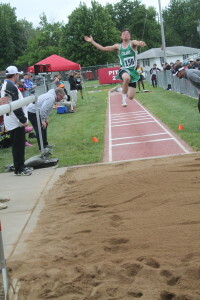 Kelly O’Bryan won both the triple jump and the long jump. Matt Campbell finished his high school track career by taking second in both the shot put and the discus. O’Bryan won the triple jump Friday with a leap of 43-11.25. The triple jump mark set a new Colome school record that has stood for a long time. Mark Kinzer held the old Colome triple jump school record. On Saturday, the Colome senior won another championship in the long jump with a leap of 21-03.75. O’Bryan said the triple jump was battle between himself and Allan McDonnell of Wall. The Wall athlete took second in 43-04.25. “It seemed like every time I would jump I would beat him and every time he would jump he would beat me. I just happened to have the last jump and a last bit of energy to bust out a personal best and set a new Colome school record.” The previous Colome school record held by Kinzer was 42-1. The Colome senior said coming into the state meet he did not come in with the idea of winning the triple jump. “My coach got me pumped up and the weather was nice. It was just the right day to do it,” he said. A humble O’Bryan explained he did not compete in the triple jump at regionals in order to allow other Colome athletes to qualify. O’Bryan had already pre-qualified for the state meet. O’Bryan said his goal was to get the school record and just make it on the podium, he did not care if that was 8th place or first. He was quick to add that first place was just icing on the cake. “There is no better way to go out as a Colome Cowboy than as a state champion,” he said. Colome track coach Charles Hosford said the triple jump was the most exciting thing he has been a part of as a coach. “To see a kid reach his potential is just amazing,” said Hosford. “When you know it is there and you see it happen in front of your and the competitive manner in which is happen was so great.” Hosford says this shows what kind of athlete O’Bryan is. Following his champion on Friday, on Saturday in the long jump, the Colome senior also came away as a champion. His first jump was 21-03.75 for first place. He just had to hold off other competitors. O’Bryan said he was nervous waiting to see if anyone would beat his mark. He was happy to see that his jump held and he was able to stand in the spotlight on the podium one more time. The senior said the triple jump fired him up to do well in the long jump. He said he could not be happier to be double winner and bring a banner back home to Colome. Matt Campbell also had a good day with a second place finish in both the discus and the shot put. Campbell had a throw of 54-06 in the shot put and 165-04 in the discus. Hosford said Campbell has been an awesome athlete and is the hardest worker on the team. Hosford said Campbell’s throws were not as well as he wanted. “For Matt, 164 in the discus is a great throw but he wanted to be up there at 180 and his shot put at 54 was great,” said Hosford. The Colome girls 4×100 relay took sixth place in :53.09. Runners were Callie Heath, Saydee Heath, Kaydee Heath and Matrix Noteboom. Callie Heath placed 8th in the 100 in :13.31.